Sixteen year old Ayano is a skilled En-Jutsushi and the successor to the Kannagi family's head. She is arrogant and irrational, usually taking action by herself even while going against orders. Though she seems undisciplined, she is very proud of her heritage. Whenever a problem arises for the family, Ayano is usually unable to see that it was the very policies of the Kannagi family that caused the problem in the first place, believing that there is nothing wrong with the way the Kannagis do things. 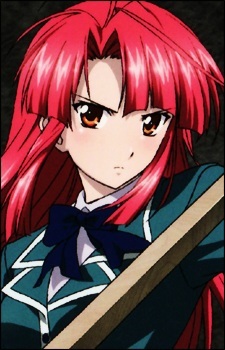 Despite claiming to hate Kazuma, Ayano develops a crush on him, but is often irritated when he makes a move on her and is prone to throwing fits of rage when he gets close to another woman. She later comes to realize that she is actually in love with him. Kazuma is also the only person she sees as stronger in power and presence than even her own father. Ayano's power is the Crimson Flame, although she is not yet able to consciously control it. She also holds Enraiha, the Kannagi's sacred sword, which she won by defeating Kazuma at the successor ceremony four years before the start of the story. The sword has fire properties and can be summoned by Ayano at any time. Ayano's friends, Nanase and Yukari, are the only classmates at her school who know about her abilities and the fact that her family hunts demons and spirits. Ayano also has something of a sweet tooth, spending a lot of time at cake shops after school and gorging herself on sweets, especially if she's in a bad mood.